A perennial best-seller, the roomy and fuel-efficient 2018 Honda Civic has become the benchmark for the compact class, which includes the Toyota Corolla, Chevy Cruze, Ford Focus, VW Golf and Jetta, Mazda3, Hyundai Elantra and Kia Forte. The new Civic is offered as a sedan, coupe or hatchback, and its available turbocharged engines produce as much as 306 horsepower. Loving my sweet new ride! I have had my car for almost a month now, and it makes me finally love driving again! While not strictly necessary, I really appreciate the side and rear cameras, particularly during my city driving. The seats are really comfortable, and the interior is beautiful. 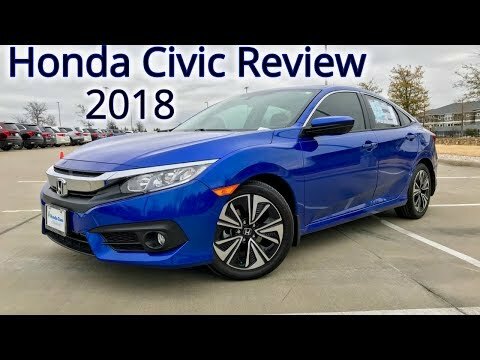 The car is overall gorgeous, Honda truly stepped up their game with this year's Civic! I haven't had the time yet to sit down and figure out the Bluetooth options, but I really look forward to being able to effortlessly connect my phone to the car for music and GPS. Initially, I was wary of the button-start and touch-unlocking, but now that I understand them, I am really excited for the added safety and convenience. She's such a smooth ride, and, while not a racing car, has the capacity to have a little kick if you find yourself needing to accelerate quickly. I 100% recommend going in yourself for a test drive. Honda Civic ex gas mileage and special camera feature. To start, I will say the gas mileage that the Honda Civic gets is fantastic! I get about 36 mpg, and it helps me a lot since I am a full time college student and also working part time. The inside of the Civic is very roomy, luxurious, and sleek. One thing I do not enjoy is the touch screen in the Honda Civic.. Mine has scratched so easily because the dirt and dust that collects on it. Wiping it off without scratching it is almost impossible. That would be my only complaint! One very cool feature that this car also has is a side view camera on the passenger side mirror. Whenever I put my blinker on to turn right, the camera view pops up on my touchscreen and I can see any potential hazards that may be in the way before turning. I love that! The Honda Civic ex sedan is a great car and I highly suggest it. Perfect for a 4 family unit, spacious, safe and reliable! My husband and I have a 2018 Honda Civic. We purchased this car for our family with a little one on the way who was due June 2, 2018. It drives smooth and I have piece of mind that I am in a reliable car with my two sons! I love that there is an extra safety feature which includes a backside camera which has saved me from getting into many accidents (my husband loves that)! And I can also call and talk hands free while connecting my phone to the Honda. You can call or anyone can call you and it their voice can be heard directly from the speakers in the car. The trunk is a perfect size since I have to bring my sons diaper bag, stroller and bouncer and not to mention groceries! We love our Civic! Honda (American Honda Motor Co.) is recalling certain 2018 Honda Civic vehicles. The manufacturing date area of the certification labels may have random characters which can affect the owner's ability to determine if a safety recall includes their vehicle. If the owner is not able to verify if their vehicle is involved in safety recall, it can increase the risk of injury or crash. Honda will notify owners, and dealers will replace the certification label, free of charge. The recall began August 7, 2018. Owners may contact Honda customer service at 1-888-234-2138. Honda's number for this recall is U23. Honda will notify owners, and dealers will replace the owners information kit, free of charge. The recall is expected to begin January 8, 2019. Owners may contact Honda customer service at 1-888-234-2138. Honda's number for this recall is O3A.